National Outline plan 46 (NOP 46) is a plan for a detention center for those who enter Israel without approval of immigration authorities, mainly from Africa. The detention center is located in the Negev, near the Egyptian border. The professed aim of NOP 46 is to deter Africans from entering Israel by conveying the message that future immigrants will not be allowed to work in Israel, but rather will find themselves imprisoned. Israeli officials declare that those to be imprisoned in the detention center are all “infiltrators”, who came to Israel only in search of work. 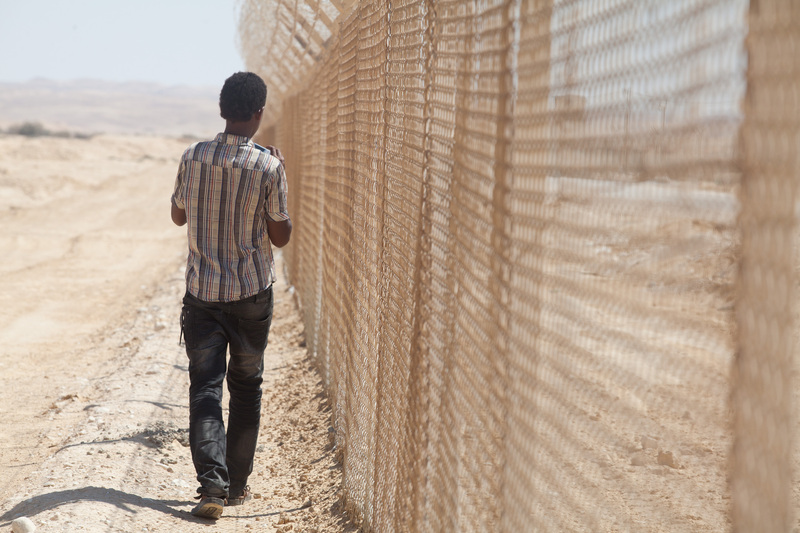 However, at the same time, Israel refuses to examine applications of the vast majority of Africans who enter its borders without permission – citizens of North Sudan and Eritrea – to be recognized as refugees. Tagging all those who enter Israeli borders without permission as infiltrators, rather than as asylum seekers was recently condemned in the yearly human rights report by the American State Department. Bimkom submitted an objection to NOP 46, both on the grounds that the professed purpose of the detention facility is illegal, and on the grounds the living conditions proposed in the plan for the detainees are unreasonable. NOP 46 was designed to allow the administrative detention of up to 11,000 people for 3 years and more which would have made it the largest prison in the world. However, in March 2012 NOP 46 was approved, adopting only a small part of our objection. Furthermore, at the last minute the National Council for Planning and Construction decided to allow the number of detainees in the detention facility to be increased by 40% – 15,400 people instead of the 11,000 – without allowing the public to object to the change in the plan. Concomitantly, the Minister of the Interior signed regulations that allow the State to build the detention center without building permits. This means that a critical layer of planning supervision is annulled. Furthermore, when construction is done without a building permit, the developer is not bound by safety standards. Therefore, the detention center can be built, partially or wholly, with materials prone to fire, without proper shelters or with sub-standard sanitation. In February 2012 Bimkom petitioned the High Court of Justice against the Minister of the Interior and the National Council against this step; the petition is still pending. In June 2012, following riots in south Tel Aviv the prime minister decided to take even harsher measures against African immigrants. In response to his request, the National Council for Planning and Construction decided to promote an amendment to the plan which allows for thousands of detainees to be kept in tents, rather than in caravans, as stipulated under the original plan. We are presentlyworking on a High Court of Justice petition against this decision. More recently, another plan has been promoted for yet another detention facility consisting entirely of tent facilities. The so-called “tent city” received a great deal of media exposure, most recently in Ha’aretz, where Bimkom’s Nir Shalev was interviewed. (see http://www.haaretz.com/news/diplomacy-defense/as-fewer-illegal-migrants-enter-israel-rethinks-need-for-new-detention-facility.premium-1.479964).